Andrew Murray, Founder of Solarchart, will be appearing on Becoming Psychic Radio Show on Thursday 25th September 2014 between 8.00pm and 10.00pm BST (7.00pm and 9.00pm GMT). 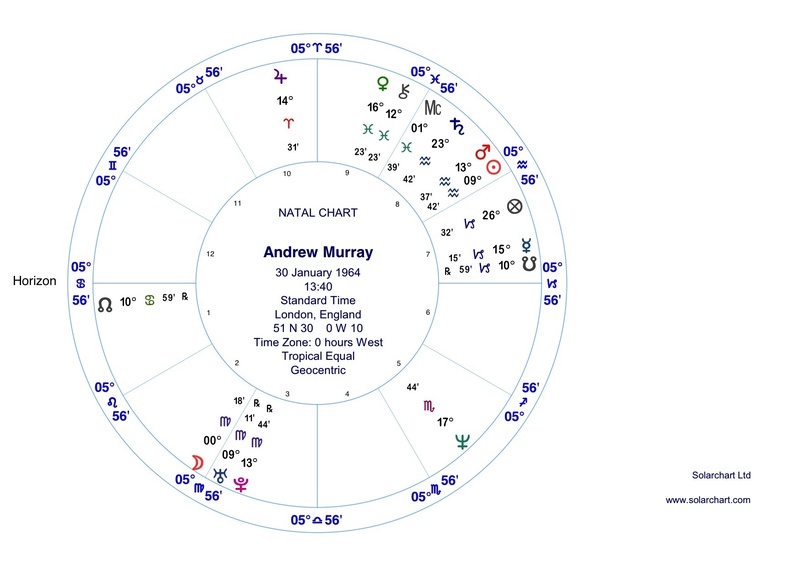 During the show, Andrew will be providing a basic explantion of astrology using the Natal chart of the Show Host, Grant Colyer. You can see Grant Colyer’s charts now by clicking on the link to the page below, and following the links. You can also click on the images below. Most of us know our astrological Sun sign e.g. Aquarius, Scorpio, etc. For those who don’t, it can easily be found from their date of birth. Sometimes, people are born on what is known as the ‘cusp’ between two signs. In such cases, in order to ascertain a person’s sign, it is necessary to the time of day that the sun moved into the new astrological sun sign, relative to their time of birth. Those who are sceptical about astrology will often argue that, with so many people in the world, it simply cannot be feasible to divide them into 12 unique categories – the twelve signs of the zodiac. How, they will argue, can it be possible for one person born under the sign of Cancer, for example, to have similar experiences to everybody else born under that sun sign? Well, as an astrologer, I actually tend to agree with that viewpoint. However, that is only because the sceptics are partially correct. Astrology is in my experience, a fascinating and revealing subject and science. Let me be clear. During the course of their lifetimes, people born under the same sun sign may demonstrate similar behaviours and have comparable experiences. However, this does not mean that everybody who is born under one particular sun sign will be the same. Each individual is unique and, as with fingerprints, everyone also has a unique horoscope or birth chart. When people ask me to do an astrological reading for them, they are often surprised when I ask them not only their date of birth, but also the time and place of their birth. This is so that I can calculate not only where the sun was placed at the time they were born, in order to ascertain their sun sign, but also where all the other planets were placed. It is only be doing this that I can produce their unique birth chart or horoscope. The best way to describe someone’s horoscope or birth chart is to imagine that it were possible to take a cosmic photograph showing where all the planets in the solar system were placed at the particular moment of their birth. That cosmic photograph captures this unique moment in time. If we were to look again, five minutes later, we would be able to see that the faster moving planets would be in a slightly different place. 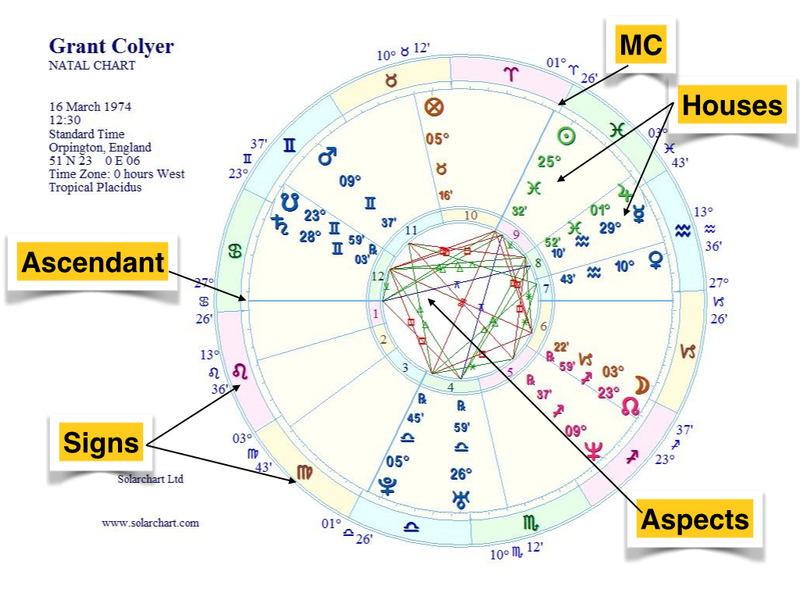 So someone born in the same location five minutes later may have a very similar birth chart or horoscope, but there would already be slight differences. 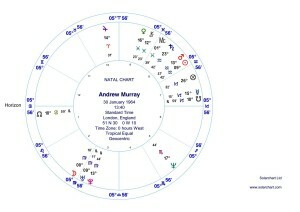 Take a look at the example chart above, which is my own natal birth chart or horoscope. 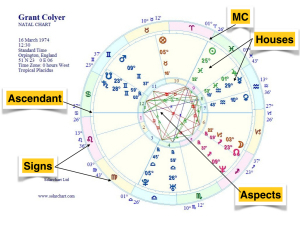 In western astrology, when an astrologer casts a horoscope, they produce a birth chart consisting of a 360-degree wheel. To simplify matters, this wheel is divided into 12 segments, each of 30 degrees. Both the time and place of birth are important, as the first thing an astrologer will do is calculate the position of the astrological sign on the horizon at the time of birth, along with its distance in degrees. You will see from the example, on the left hand side of the chart, marked ‘Horizon’, a glyph that represents the sign of Cancer (shown as ). This shows that the astrological sign on the horizon (also known as the ascendant) is five degrees and 56 minutes of Cancer. Once the astrological sign and degree on the horizon have been calculated, the same degree is placed on the cusp of each of the other segments. As we now know the sign on the horizon, and we know the order of the zodiac, we can then mark each of the other cusps with the appropriate zodiac sign. The degrees to which each planet will be in each sign of the zodiac can be calculated based upon our knowledge of their respective orbits, and then recorded in the appropriate area of the birth chart. We now effectively have a visual map showing where all the planets are placed at our moment of birth. It can be seen that some planets are close to each other, with some appearing to be in the same sign although they are in different segments of the chart. By looking at the three planets in the second and third segments (known as houses) of the chart, for example, it can be seen that all three are in the sign of Virgo, but that the moon is in the second segment, whilst the other two planets (Uranus & Pluto) appear in the third segment. Now it is possible to interpret the horoscope by seeing which signs the planets are in as well as which segments (houses) of the chart. Each segment (or house) represents a different area of our lives. It can also clearly be seen if two planets are close together, and the distance in degrees between each of the planets in the chart. These relationships between the angles of the planets are known as the planetary aspects. Over the course of the next few months, some of the above concepts will be expanded upon in more detail. However, it’s important to understand the concept that your horoscope is unique to you and consists of a blueprint laid out from the position of the planets in the cosmos at the time, place and date of your birth. We may have much in common with other people born under the same sun sign as us, but the planets are all in a constant state of movement. Each planet, depending upon its size and position in our solar system, has a unique orbit, each moving at different speeds. As they continue to move, it is possible to see the angles and relationship between where the planets are placed now, and where they were placed in your horoscope blueprint – each interaction bringing challenges and opportunities to our lives. This allows an astrologer to give guidance on what unique planetary energies are in play in our lives, to help us understand that the universe is perfect and that through the lessons presented to us during our earthly existence, as the planets dance in their orbits, we experience all that our higher selves wished to learn. Halloween, or ‘Samhain’, was considered by the Celtic people to be a major date in the year, where the veil between the spiritual and physical realms was at its thinnest. This date of 31st October was a time of recognition of the end of one cycle and the re-birth and growth of the next. It is perhaps of significant interest then that 31st October 2013 is a date on which, astrologically, a great deal of activity is taking place, connecting to this important Celtic concept of re-birth and regeneration. On this date, the two major planets of Pluto and Uranus form what is known as a “square”, or angle of 90 degrees, between one another. 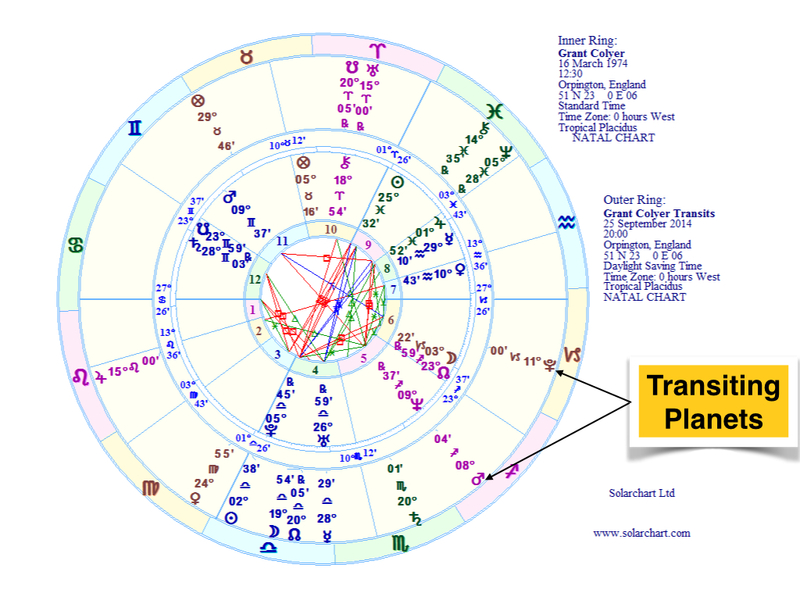 Pluto will move to 9 degrees of Capricorn, whilst Uranus will move to 9 degrees of Aries. Astrologically, Pluto is traditionally recognised as the planet that represents transformation, rebirth and regeneration, and is also strongly associated with the afterlife, being the astrological ruler of the sign of Scorpio. Uranus on the other hand is the planet most connected with innovation and invention, technology, rebellion, revolution and unexpected and sudden change. It is also correlates to humanitarian causes, individuality, freedom and idealism. When two major planets such as these engage with one another, there are bound to be influences that affect us all to a lesser or greater degree. To understand these influences astrologically, it is necessary to consider not only the planets concerned and their attributes, but also the astrological signs through which they are travelling at the time, as well as the way that their combined energies are likely to manifest. Pluto travelling through the sign of Capricorn is likely to bring its transformative attributes to those spheres with which it is associated, such as business, government, organisations and other such structures. At the same time Uranus, travelling through the sign of Aries, is likely to bring unexpected change, revolution and technological advances to the Aries domain of direct leadership, pioneering new ideas, energy, impatience and aggressiveness. Throw all of these energies into a melting pot and you have a recipe for much of what we have seen in our world over recent times – revolution, change and transformation of organisations, businesses and governments. We see society striving for greater freedoms and human rights against a backdrop of new technologies, that sometimes create dilemmas for our wider world. We have also witnessed pioneering breakthroughs in medicine that have created moral issues that challenge the status quo within society. Given the above, it’s perhaps not surprising then that the exact square between Pluto and Uranus, taking place on 31st August 2013, is actually the fourth of a series of seven such squares. The first one was in June 2012, and the final one will take place in March 2015. However, as these planets are relatively slower in their movement across the heavens, the actual dates on which they form exact angles with one another tend to indicate actual turning points within a much greater process. There are likely to be events that take place on 31st October that will contribute to the greater manifestation of these combined powerful energies that seek to transform our world towards a new cycle. It is a time for each of us as individuals to consider what we have learned so far and how we can use that knowledge in a positive way for the future. However, we all have a choice as to whether we utilise the positive or negative energies of Pluto and Uranus and all the other astrological planetary influences taking place around us. The more negative aspects of the Pluto / Uranus squares can be seen internationally in situations such as Syria and Egypt, where the rebellious and revolutionary nature of Uranus and the transformative power of Pluto can become a dangerous and challenging force to the existing governmental structures, leading to conflagration, war, death and destruction. But as we embrace the annual regeneration associated with Halloween or ‘Samhain’, we should not underestimate our own free will and power as a collective, to choose to embrace the higher, positive aspects of these planets – such as intuitiveness, inventiveness, positive transformation and deeper spirituality. As the veil between the physical and the spiritual thins, we need to consider how we can each shift our own consciousness to the psychic and unconscious energy all around us, in order to achieve a greater understanding of why the world may unfold in the way that it does; recognising that from the death and ending of one cycle, is born the wonder and excitement of a new one.